"Ray Emery will have surgery in the near future to repair his right hip. He is suffering from avascular necrosis and will have a bone graft done to alleviate his hip issues. Ray will be out for the remainder of the season." In 29 games this season, Emery is 16-11-1 with a 2.64 goals against average and .905 save percentage with three shutouts. 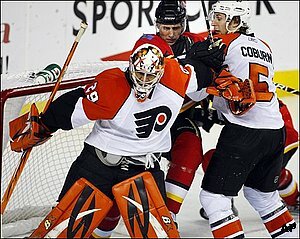 He was signed by the Flyers as a free agent on June 10, 2009. Q - Did the doctors give you any indication that you’re going to be able to bounce back from this? Q – Do you think your career is in jeopardy, or is that something you have no idea about? Q – How frustrating is this? You just got back from another injury. Emery: “Yeah, well I think [the previous injury] basically was caused by this. Your hips start to get out of whack and everything else tries to compensate for it. Before I had the surgery, it was my abdominals, but the next day I felt my groin was pulled on one side and then my groin was pulled on the other side. There was always something just not feeling right. That was the problem that showed up on the tests. Q – Do you think that playing so many consecutive games played a part in this? Emery: “No. When I play, I want to play a lot. I can judge those things. It is something that, from what I’ve heard, is kind of a genetic thing. You have it, and it can come up when you’re older or younger, depending on how much you use it. Q – In layman’s terms, what is this injury? Emery: “Basically, there’s no blood getting to the femoral head or the top of your femur. Normally, that bone is regenerated and it has a blood supply to keep it healthy. Mine has stopped somewhere along the way, so it just doesn’t get any blood. Q – Would you like to re-sign here?